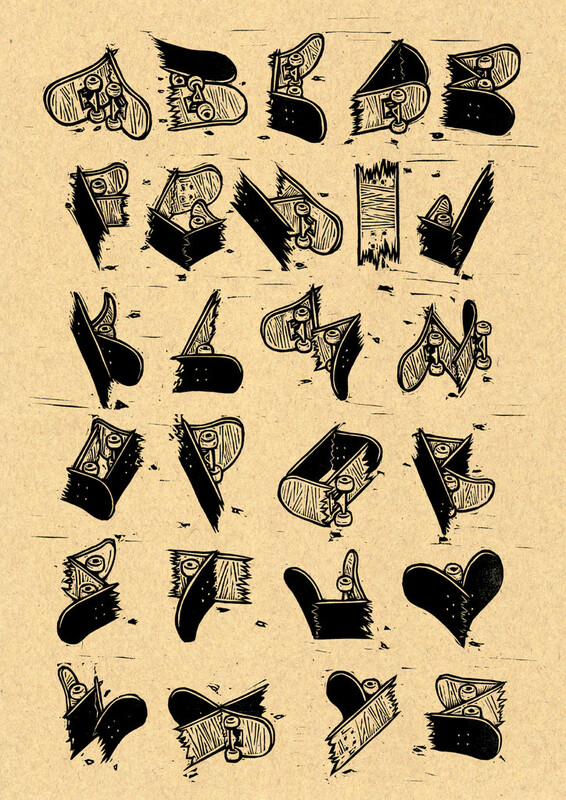 Dylan Goldberger has an exclusive print on Limited Posters called, Broken Board ABC. The 16.5 x 23.4 poster is a reproduction of a linoleum block print and shows 26 “focused skateboards,” one for every letter of the alphabet! Goldberger’s work ranges from blood and gore (as you may have seen in our interview with him) to the downright whimsical. This one is for the kids! Even if that kid is a rage filled skateboarder who takes out their frustration of not landing their trick on an innocent skateboard. Limited-Posters only offers each print for a week, and if they don’t sell at least 15, they don’t start production. So, who knows, maybe they print 15 and you’ll have a super limited print of Dylan Goldberger! And we have to mention that a portion of the sales go to our favorite organization, Skateistan! If you’re in the US, shipping and the print is going to run you about $45.00, in the EU about 30 Euro at Limited-Posters. A bonus for everyone reading this, put “2:1 SPECIAL” in the “Notes about this order” and you’ll get a second print for free!! !